The Jean Paul Gaultier Autumn/Winter 2006-2007 Show, « Sleepy Hollow », was inspired by Tim Burton’s eponymous movie. One « Sleepy Hollow »-inspired makeup : Giles Autumn/Winter 2012-2013 (the muse of the makeup by Lucia Pieroni could be on the « Sleepy Hollow » set). Moreover, « Sleepy Hollow » is one of Riccardo Tisci’s favorite movies. Lydia Deetz, Winona Ryder’s character in Tim Burton’s « Beetlejuice » influenced the Deetz Spring/Summer 2013 Collection, designed by Amy Currie. Other Beetlejuice-inspired collections : Costello Tagliapietra Autumn/Winter 2012-2013 (the spectral influence of this collection was based on the prints painted by Jeffrey Costello, which looked like something taken from « Beetlejuice »), James Long Spring/Summer 2013 (James Long told « British Vogue » that this collection was about « a kind of a PJ Harvey meets Beetlejuice »), Quentin Veron Autumn/Winter 2009-2010 (partly based on « Beetlejuice »). Furthermore, Altuzarra’s Autumn/Winter 2010-2011 Collection was inspired by the aesthetic of Tim Burton’s movies, and Henry Holland dressed as Betelgeuse, the character portrayed by Michael Keaton, both for Halloween 2007 and Halloween 2008. 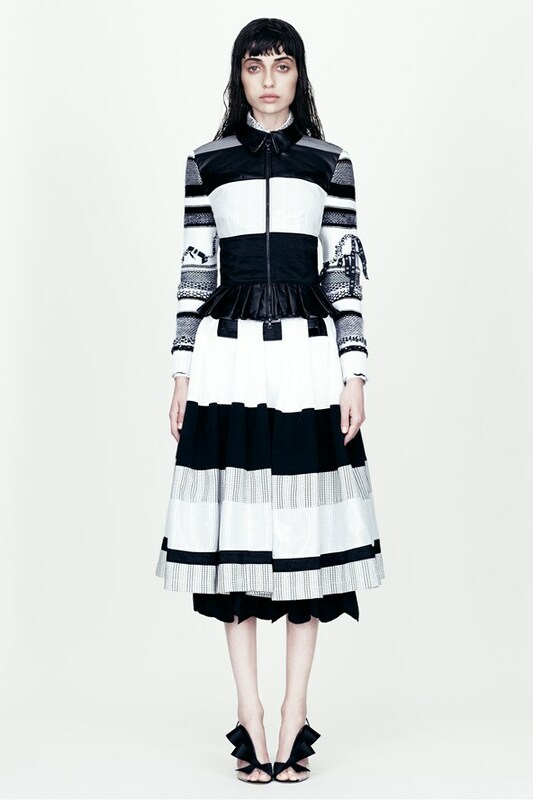 « A kind of a PJ Harvey meets Beetlejuice » is what James Long told « British Vogue » to describe his Spring/Summer 2013 Collection. Other PJ Harvey-influenced collections : Felder Felder Autumn/Winter 2009-2010 (this collection, partly based on PJ Harvey, was « feminine, cool and a little bit raunchy », according to Annette and Daniela Felder), Jill Stuart Autumn/Winter 2012-2013 (this collection was inspired by the women close to Nick Cave), 3.1 Phillip Lim Spring/Summer 2013 (some shoes were named after PJ Harvey, who also inspired some pieces). The Altuzarra Autumn/Winter 2010-2011 Collection was inspired by the aesthetic of Tim Burton’s movies, especially « Edward Scissorhands ». Other « Edward Scissorhands »-style collections: Bora Aksu Autumn/Winter 2010-2011 (« Edward Scissorhands » mixed with Marie Antoinette), Rodarte Autumn/Winter 2009-2010 (more specifically partly inspired by Boris Karloff in James Whale’s « Frankenstein », this collection featured « Edward Scissorhands » scalpel-like cuts).